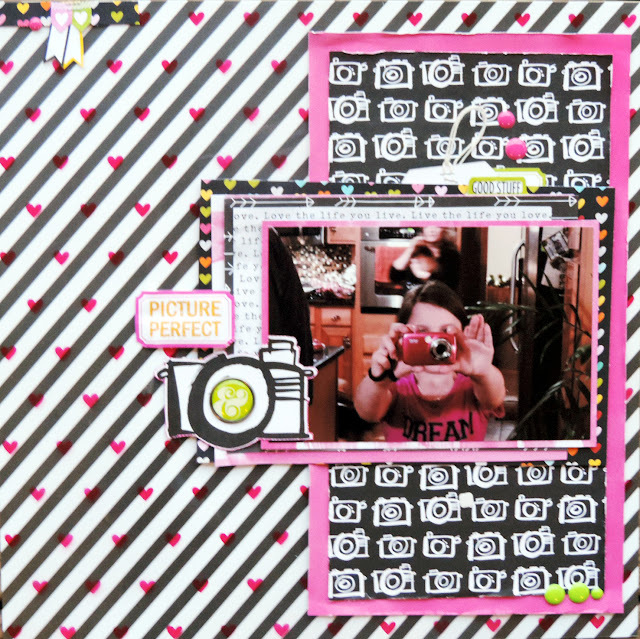 Today I have a new layout to share with you using up some bits and pieces from my stash. I decided its past time to keep holding on to all those items I just "had to have" and start using them! I wanted to keep this layout bright and fun, my daughter had been so excited about the camera she had got for Christmas, that she wanted to take a picture of me...taking a picture of her! lol. For the background, I used this horizontal striped paper from Simple Stories, but I wanted to liven it up a bit, by layering a transparency from Crate Paper over it, I was able to bring in some more of that bright pink, but still let the stripes shine through. This layout started out all pink, black, and white, but I just wasn't feeling it, so I layered in that rainbow heart paper from Bella Blvb, and then was able to build off of those colors with some of my embellishments!